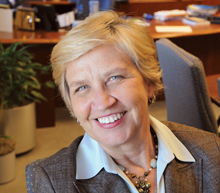 Linda McCauley is dean of Nell Hodgson Woodruff School of Nursing. Linda McCauley, PhD, RN, FAAN, dean of Emory University’s Nell Hodgson Woodruff School of Nursing, was invited to the White House on April 9 for a roundtable discussion about climate change and health. The event was part of a series of National Public Health Week announcements by President Obama to reduce the health impacts of climate change. McCauley is part of a coalition of deans from 30 medical, nursing, and public health schools around the country committed to ensuring that the next generation of health professionals is trained to effectively address the health impacts of climate change. The roundtable event was aimed at building on the leadership of these institutions in incorporating climate change into their programs. Senior Administration officials participating in the roundtable included Brian Deese, senior advisor to the President; John Holdren, assistant to the President and director of the Office of Science and Technology Policy; Christy Goldfuss, managing director of the Council on Environmental Quality; and Dan Utech, deputy assistant to the President for energy and climate change. In addition to Dean McCauley, the roundtable included nursing deans from Washington State University, Johns Hopkins University, New York University, University of Pennsylvania, and University of Maryland as well as deans from schools of public health and medicine. View a fact sheet on President Obama’s Health Week announcements.